There’s something mysterious about a cob of corn in its husk. At first it feels smooth and compact. You have to tug on those tough papery sheaths to reveal the gold kernels. It’s surprising how hard you have to pull — halfway through, I’m thinking, this prize better be worth it. And then there are the silky threads barring your way from eating. Silky sounds lovely, doesn’t it? It sounds like clean-washed hair and expensive sheets and the purr of someone’s beloved voice in the dark. Well let me tell you, these silky threads are nothing like those. Those buggers cling to the kernels like a kid to her mama’s leg when she doesn’t want to go to school. (And without any of the endearing cuteness, either.) Sure, you can shred a big fistful of them away from your corn quickly, but the rest nit and pick and sit there without your fingers being able to budge them. This is my least favorite part. After that’s over, however, there is corn. Sweet, tender corn. p.s. I have to tell you this, although it has little to do with the wonder of corn. When we were in our late teens, my brother and Sharon and I used to make these ridiculous little films with a big video camera. One summer, we made up a mock-mystery about the death of the member of a popular band. (She died when someone viciously threw a Jujubees box at her head. Yeah, you get the sense how good these films were.) All I really remember of this film is that the band’s biggest hit was called Hot Buttered Corn! Sharon and I must have sung that phrase into a shared microphone 28 times until Andy had the shot he wanted. We cracked up most of those takes. And now, whenever I cook corn kernels in brown butter on the stove, adding basil or chives at the end, plus a pinch of sea salt, the entire time I am stirring I am thinking Hot Buttered Corn! more, more, more if you want it (potatoes? sweet potatoes? root veggies? winter squash?). You name it. Corn and risotto go together like fuzzy sweaters and foggy mornings, like hot coffee and cold cream, like clean sheets and bare feet. There’s comfort in the softness of the rice, plus the surprise of the warm corn kernels popping against your teeth. Slightly sweet from ripeness, salty and filled with the warmth of garlic and thyme, this risotto makes the mouth happy. And then it’s gone, quickly. Don’t be intimidated by the process of making corn stock. It sounds complicated. It’s not. Mostly, you throw husks and cobs into a big pot of water and wait for it to simmer into flavor. This way, you use every part of the corn. This time of year, you don’t want to miss a thing. Shucking the corn. Remove the husks and hair from the corncobs, but do not discard the husks. Slice the kernels from the corncobs, but do not discard the cobs. Making the stock. Set a large saucepan over medium-high heat and pour in the oil. Add the onion and garlic to the oil and cook, stirring, until the onion is softened and translucent, about 5 minutes. Add the corn husks, the cobs, and the thyme. Cover with 2 quarts of water. Bring to a boil, then reduce the heat and simmer for 30 minutes. Strain the stock. Starting the risotto. Set a large saucepan over medium heat and pour in 1 tablespoon of the oil and the butter. Add the corn kernels to the hot oil and butter and cook, stirring occasionally, until they soften and release their fragrance, 3 to 5 minutes. Add the onion and garlic and cook, stirring occasionally, until the onion is soft and translucent, about 5 minutes. Add the thyme and cook for 1 minute more. Coating the rice. Toss in the Arborio rice and cook, stirring occasionally, until all the grains are entirely coated, about 2 minutes. Pour in the wine and cook, pushing the rice slowly in the pan, until the liquid is reduced by half its volume, about 5 minutes. Adding the stock. At this point, pour the corn stock into the rice, 1 cup at a time, stirring gently. Stir and stir until the stock is absorbed into the rice. When the liquid is absorbed, but not dry, add more stock. Continue this process until all the stock is absorbed. Making the risotto creamy. Taste the rice. It should have no crunch to it. Instead, it should be chewy and soft, without being mushy. Taste the risotto and season with salt and pepper. Taste again. Toss in the remaining 3 tablespoons of oil and the Parmesan cheese. Stir gently until everything is fully incorporated. Place the lid on the saucepan and allow the risotto to sit, covered, for 2 minutes, which will make the risotto beautifully creamy. I made this delicious satueed corn with tons of herbs from the August Bon Appetit – it was super good, and no silk in my teeth! The risotto sounds divine, Shauna – yum! We had sweet corn last night that I picked in the morning. MmMm. This sounds great! This sounds fantastic! I can't wait to make this! Perfect summer side dish. I have never had corn risotto. I can't wait to try it. This sounds wonderful. But I guess I am just not willing to go to that much effort for just me. You do make me … wish I liked to cook… And food that loves me back would be really nice. Thank you for sharing your "kitchen" with me. I just posted a recipe for Indian-Style Corn. It made my lunch AND my day. I love the idea of making corn stock for this risotto. Thanks for the recipe – it sounds wonderful! I have a recipe to share for corn and squash sauté that is a breeze to make and tastes of summer. Enjoy! This totally makes me want to write a song called 'Hot Buttered Corn'. Totally cracks me up because I can remember making videos like this (with the GIANT video recorder). So it totally makes sense to make corn stock for corn risotto. I am not surprised that you two would think of this!!! A big bowl of summer goodness please! For Summer Fest this week I made Grilled Corn Salad with Lime Vinaigrette on Corn Cakes. It's the first thing Ive made this year with corn b/c Ive been too busy eating it straight off the cob. Was worth the wait. PS – I really love your tweets about Lu – always brings a smile to my face!! Yum! 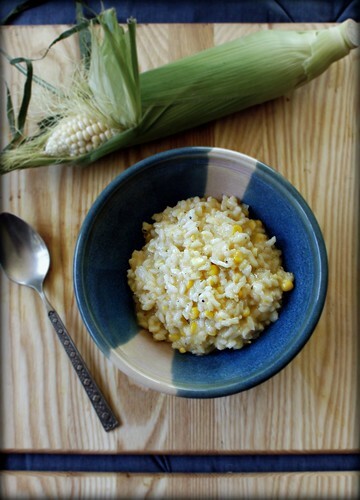 I love risotto in any form or fashion, especially the fresh corn – looks delish! I joined in on Summer Fest this week with some Fresh Corn and Black Bean Salsa. You two are the best. Fun and inspirational, especially to those of us who are gluten-free (and our case also dairy-free), and understand the joys (and tribulations) of family. I believe in making the most of everything. Here's my post for SummerFest. Note the dairy free one is away for now. or I wouldn't have dared. I once heard a band that called themselves Cornbread. One of the band members, a woman, handed out pieces of cornbread. Thinking about it now I wonder what they put in it. Sweet corn risotto is one of my all-time favorites. I freeze fresh-scraped kernels so we can enjoy it in the winter too. And those leftover cobs are good for making ice cream, as well as stock. I'm throwing some sweet corn & lemon thyme ice cream into this mix this week, along with a gluten-free and creamless corn chowder! Oh my Shauna, this looks truly delish. I am salivating. We just got corn in our CSA last night. Thank you, and if you weren't already married to a super guy I'd be proposing… even tho I am married to a super guy too. My 5 yo son loves risotto – especially at breakfast. made in a slow cooker overnight with apples and cinnamon and nutmeg and cloves and cream and brown sugar and some juice. heaven! Steam the corn and beans just enough for them to be crisp-tender. Cool rapidly in cold water. Cut the beans into 1/2 inch chunks, and strip the corn from the cobs. Stir all the ingredients together in a big bowl. Beautiful, and tasty! Eat within a couple of days, or it gets weird looking, though not weird tasting. Wow — corn stock! I can't believe I've never thought of using the cobs, too, just cutting the kernels off. Can't wait to try it. Just pre-ordered your book. Excited to be getting it soon! A very gentle scrubbing with a vegetable brush will get those last corn silks right out. I'm definitely trying this recipe! A few nods to fresh sheets in this post and I feel like I need to go do some laundry! Wish I could hear that "Hot Buttered Corn" song. Hilarious!! your risotto looks creamy, satisfying & delish! The summerfest is such a great idea. I am new to blogging and appreciate the opportunity to share my gluten free blog. I have a few corn recipes to share. I read this while systematically annihilating an ear of corn, stone cold but delicious, at my desk at work. Now I wish I had at *least* 2 more ears!! I can't wait to try this risotto. I am very new to the risottos, but getting my celiac diagnosis a year ago made me look at many new foods, and risottos are my favorites! now I'm hungry. luckily, i've got all the fixins for your risotto in my kitchen. I've been making this Corn and Tomato Gratin I found on Epicurious (Gourmet 2006) for the last 3 years. It's one of those dishes I dream about for months before the tomatoes and corn are ready. Corn, thick-sliced tomatoes, cream, basil, parmesan, and topped with breadcrumbs, but I'm sure you could whip up an easy GF alternative–you have to try this! Risotto? With sweetness! Great idea! Thanks! My husband and I just had two ears each the other day for a snack and could have gone for thirds. Your risotto sounds wonderful. 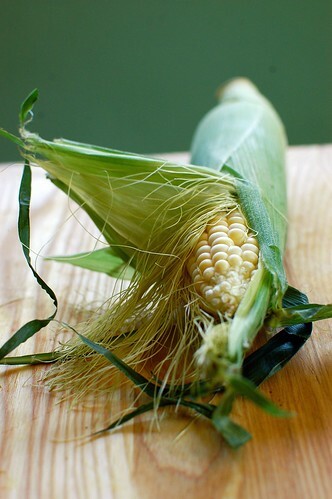 This will be the very next thing I try with our gorgeous Jersey corn! oh my goodness I love love love the top corn photo. gorgeousness. it was so nice chatting photography with you, its more photo-ness than I've had in my brain in several months and it felt really nice! Your photos are looking amazing and I can't wait to see what you shoot next. I wanted to pass on…we have Italian relatives, so eat a LOT of really good risotto when we visit them. (We eat a lot in between visits, too!) My husband became a vegan a couple of years ago, and we have found that adding about 1/2 to 3/4 cup of Tofutti to the risotto at the end instead of parmesan, achieves that creaminess that you get from the cheese. Haven't tried any Daiya yet. But it might get it, too. We've been definitely soaking up our fair share of corn this summer. This risotto looks delicious! Yummy, can't wait to try it! Sweet corn makes the most perfect summer soup. I've been growing some in my garden… now I know how I'm going to use it! I made this with brown rice which made it not risotto but the the flavors were great. I wouldn’t normally spend all that time to make corn stock, I’m so glad I did!